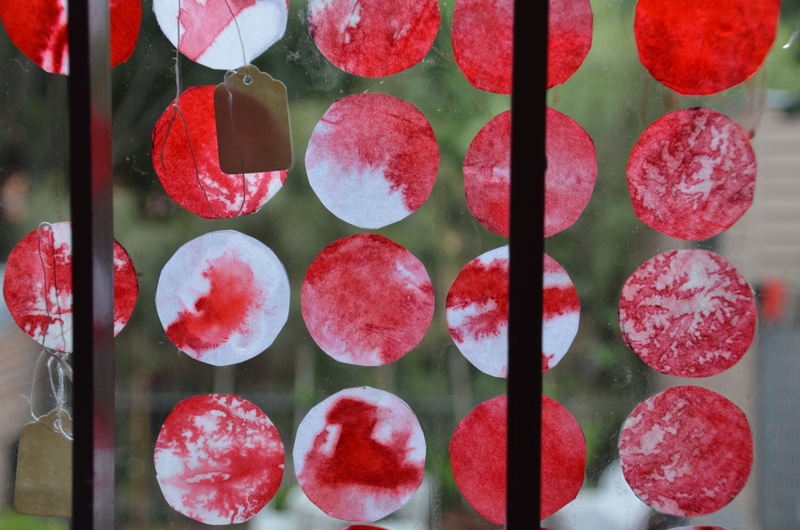 During December 2011 and January 2012 a multi-paned installation was presented on the windows of Davies’ studio at Culture at Work in Pyrmont. The circles of stained rice paper were arranged and labelled to reference standard laboratory practice, recording results, recording the past, and recording history. The circles are also beautiful and reward individual attention. The frame of the cut circle focuses attentino on the stain within the circle and how that stain interacts with the edge of the circle. the apparently randomly located manilla cardboard labels hang on string drawing attentino to indiviual circles within the incomplete grid. Blood on Silk is a three year cross disciplinary collaboration between Dr Peter Domachuk, ARC Postdoctoral fellow, School of Physics, University of Sydney, Dr Lee Anne Hall, UTS, a writer, cultural theorist and arts management academic and a visual artist, Fiona Davies.